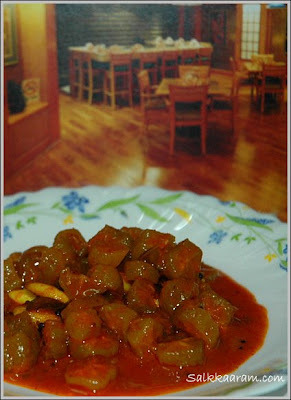 Irumban Puli Achar / Bilimbi Pickle | Simple and Delicious ! Our villagers had a very painful day on last week. A seven year old boy hanged himself on the window, for some silly matter! Could you believe? It was easy to believe if some more years have added to his age.I do blame only mothers and other family members who are addicted to Tv serials and films.Movies or serials simply shows how easy to end a life.. Mothers here, do not care when children watching Tv with them. Two more years back same thing happened to a 12 year old boy, who made bet with his friends while coming back home after playing. He showed his friends how to end life by climbing on a jack fruit tree, tied with his bath towel and jumped down.Children watching below thought it was just play, it was too late when they understand the truth.Both of these incidents much affected us, I hope , at least few mothers who read this could stop their children watching TV much.. I hope you all know what is bilimbi or Irumban puli. It is known as many different names in parts of Kerala.Ilimbi, Ilumbanpuli, Chemmeen puli or Keerichakka are some among them. (Click here to see the pictures) It is used to make squash, jam, pickles or mainly added to fish curries. Recently I heard, some prepared cake with it! Wash the Irumban puli and remove the stems while chopping. Mix it with salt and pickle powder. Keep it for one hour. Heat oil, splutter mustard seeds. Add garlic pearls, chopped green chillies,curry leaves and saute for a while. Add red chilly powder together with Irumban puli. Saute for some time, check for salt, and add if needed. Pour vinegar over it, remove from fire. Keep this out side for one week, then keep in fridge. Tip: Wipe spoons very well before you take any pickle. Wetness soon damage pickles. so sorry to hear that about those kids, some kids are so stupid even at 14! Movies these days are so violent, it's scary. I think I know that fruit, very very sour, isn't it? I bet pickle tastes great with those, looks good Seena. So sad about the incident Seena! I agree with you, the tv serials are playing much effect on small children. Don't know when they'll stop showing such horrible serials! Never heard of this pickle before. Looks so delicious. I love the picture Seena! It sounds delicious and looks amazing. I never knew this puli was called irumban/bilimbi. a great recipe. Sad to hear all this stupid things kids doing! But I definetly blame all those Tele serials i hate them! I am not sure if i have seen this fruit but delicous ur pickle! thats too bad, what happened to that little guy!! love ilumban puli!! i love a drink that my aunt makes out of it. Dunno how it is made though, but it was perfect for summer! Hmm, ya most 'Kannurians' make Excellent food.....so many varieties....My mom is a great cook and she's gained local fame for her kaipunyam....enikku athu kittiyilla ennu thonnunnu....Im mostly into baking than naadan food. But my husband likes naadan ones. Entha cheyya.... So Im forced to make it too..:)...And ur site is one great samaadanam...Its a rich source....Thx for stopping by my blog. The path to our tharavadu used to be lined with ilumban puli trees. Used to love eating it. Your post brought back lots of memories. hai Seena kuttie..how are u..
hey, i like the way u have taken the snap..is it either in a restaurant, or taken against a picture background? We had a this tree in Mangalore! We used to add it to some of our curries. The pickle looks yummy! Sad to hear about the story. Dish looks lovely! Seena, sorry I haven't been to your blog in a while. Love your new layout and design. Looks very nice and professional. Delicious looking pickles. Something new to me. like Eastern pickle powder for pickling, comes out really good. Got to try this recipe...tangy and yum. We call bilimbi souree in these parts :) for the obvious high acid content. I made achar with some last year too. ooh the last time i saw this puli was when i was in school! we have lotz of irumpan puli here at our home. we shall be trying out this tomorrow. if anybody wants irumpan puli, this can be given free of cost. telefone number could be given if you need.